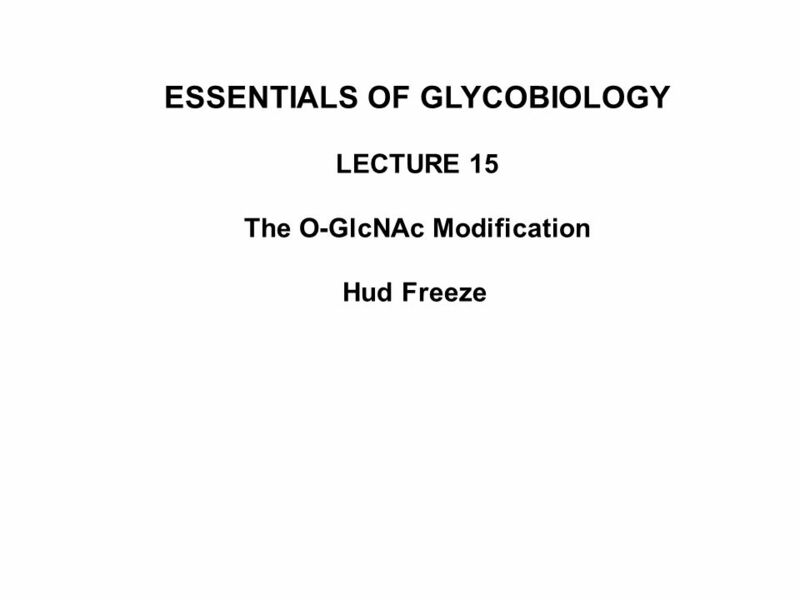 ESSENTIALS OF GLYCOBIOLOGY LECTURE 15 The O-GlcNAc Modification Hud Freeze. 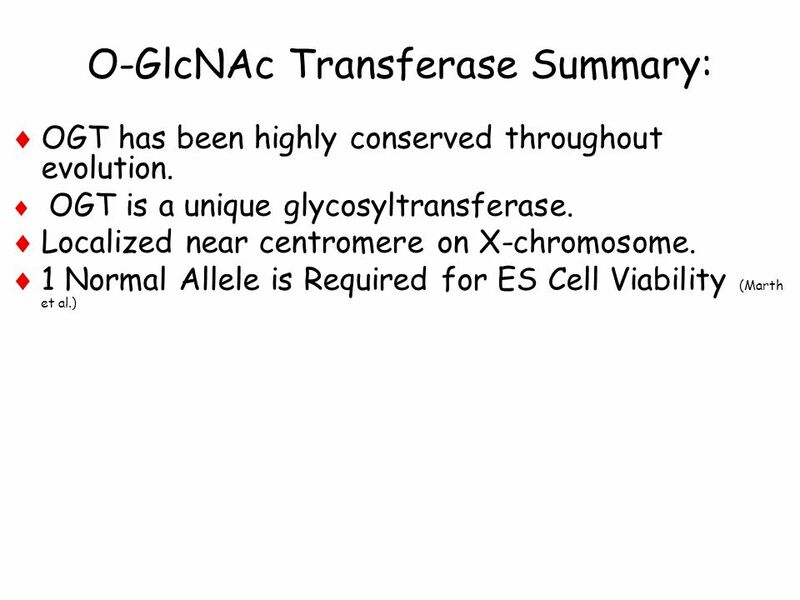 4 Key Features of O-GlcNAc :  NOT elongated to more complex structures.  Localized to the cytoplasm and nucleus.  Present in all higher eukaryotes studied. 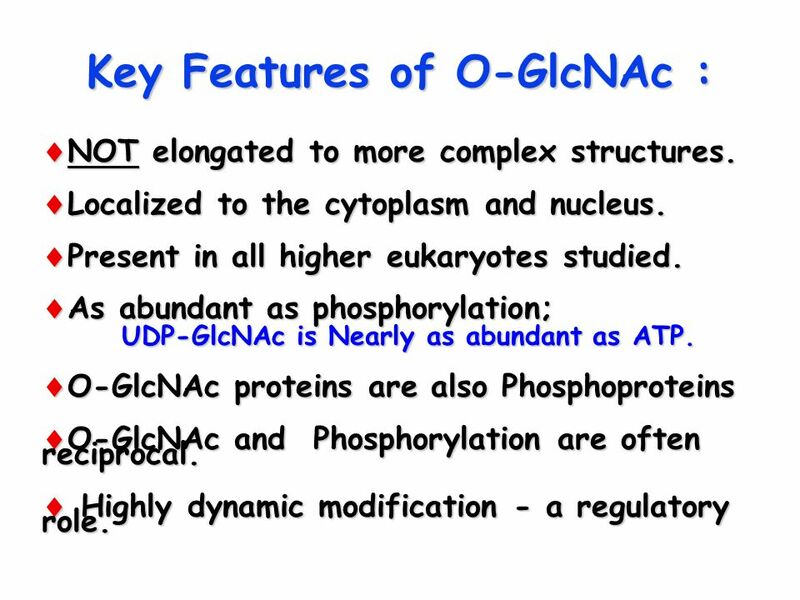  As abundant as phosphorylation; UDP-GlcNAc is Nearly as abundant as ATP. 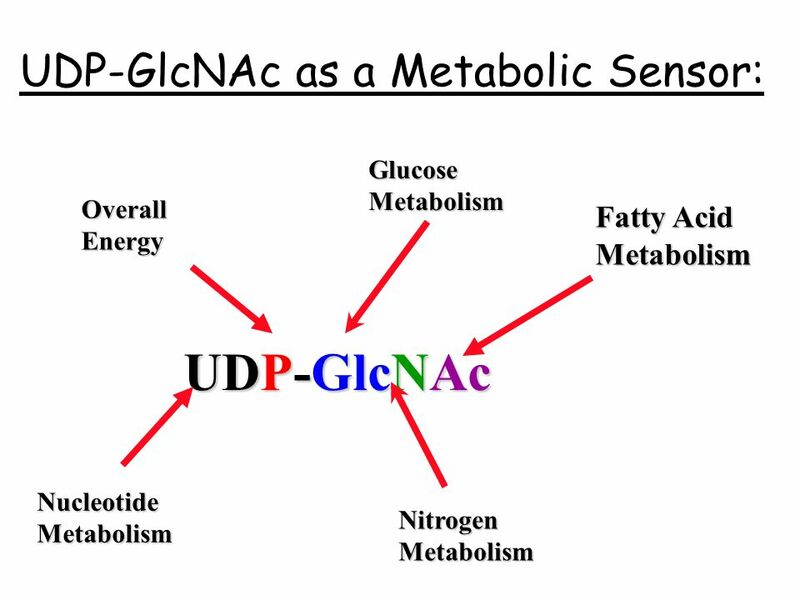 UDP-GlcNAc is Nearly as abundant as ATP. 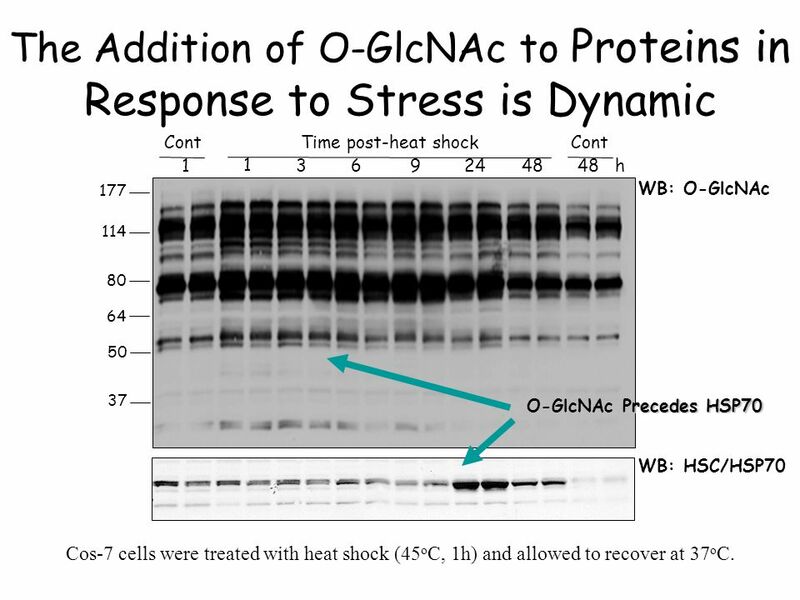  O-GlcNAc proteins are also Phosphoproteins  O-GlcNAc and Phosphorylation are often reciprocal.  Highly dynamic modification - a regulatory role. 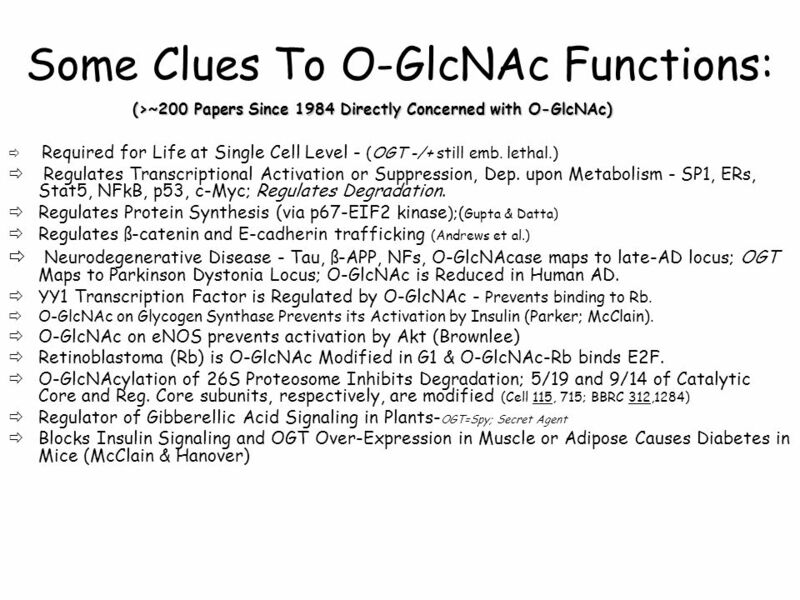 18 Functional aspects of O-GlcNAcase  Maps exactly to 10q23.1 - late onset Alzheimer’s Disease Locus. 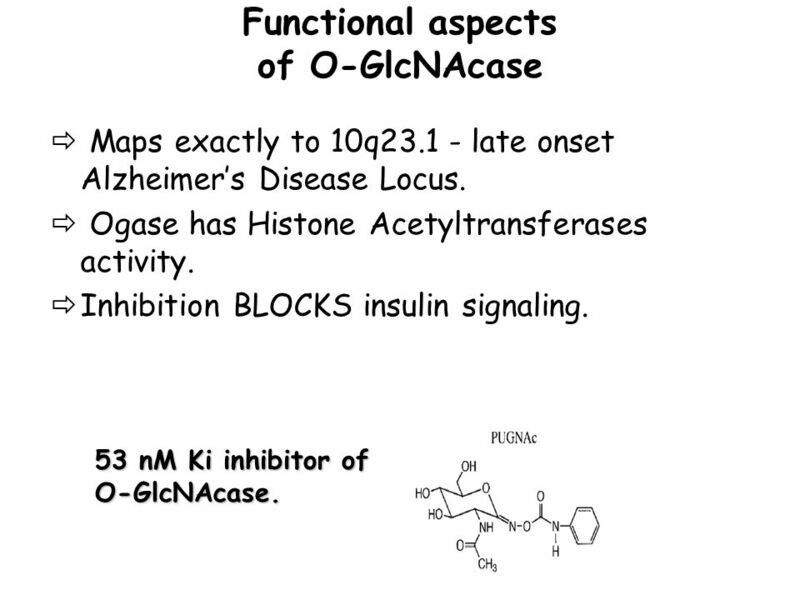  Ogase has Histone Acetyltransferases activity.  Inhibition BLOCKS insulin signaling. 53 nM Ki inhibitor of O-GlcNAcase. 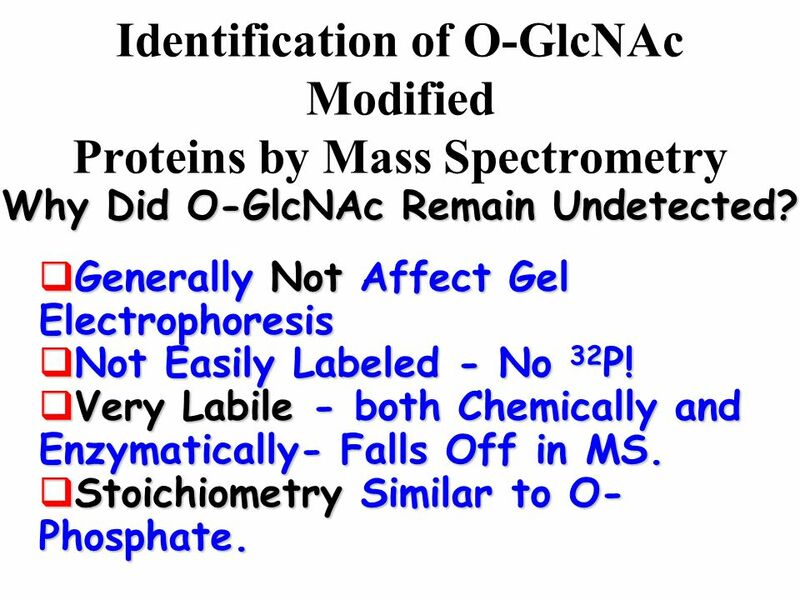 19 Identification of O-GlcNAc Modified Proteins by Mass Spectrometry  Generally Not Affect Gel Electrophoresis  Not Easily Labeled - No 32 P!  Very Labile - both Chemically and Enzymatically- Falls Off in MS.  Stoichiometry Similar to O- Phosphate. Why Did O-GlcNAc Remain Undetected? 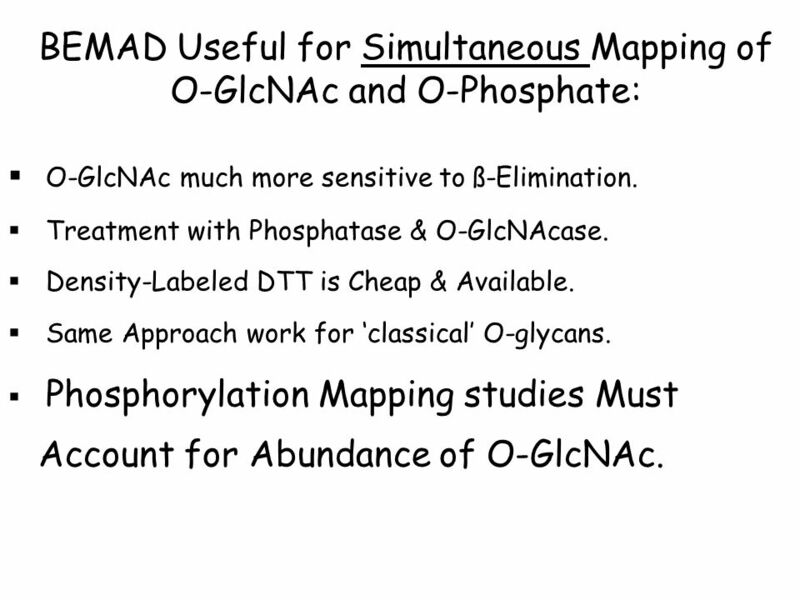 22 BEMAD Useful for Simultaneous Mapping of O-GlcNAc and O-Phosphate:  O-GlcNAc much more sensitive to ß-Elimination. 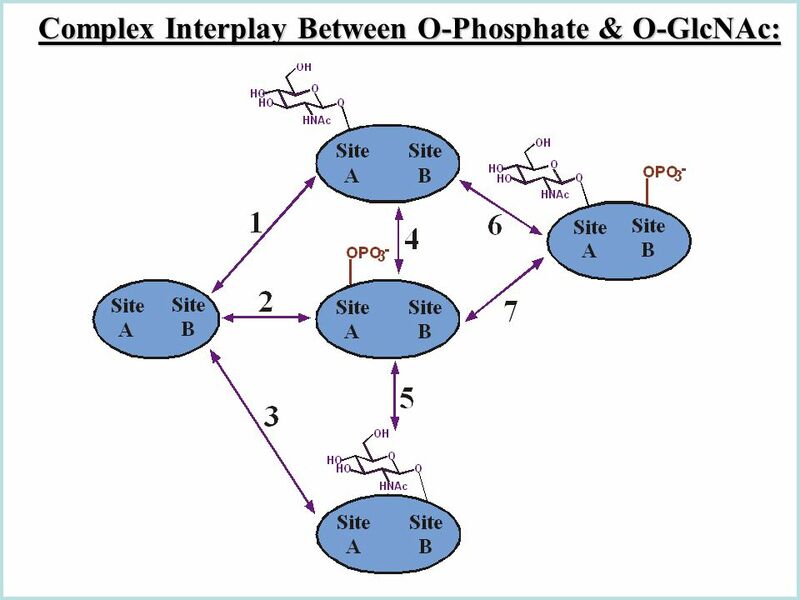  Treatment with Phosphatase & O-GlcNAcase.  Density-Labeled DTT is Cheap & Available. 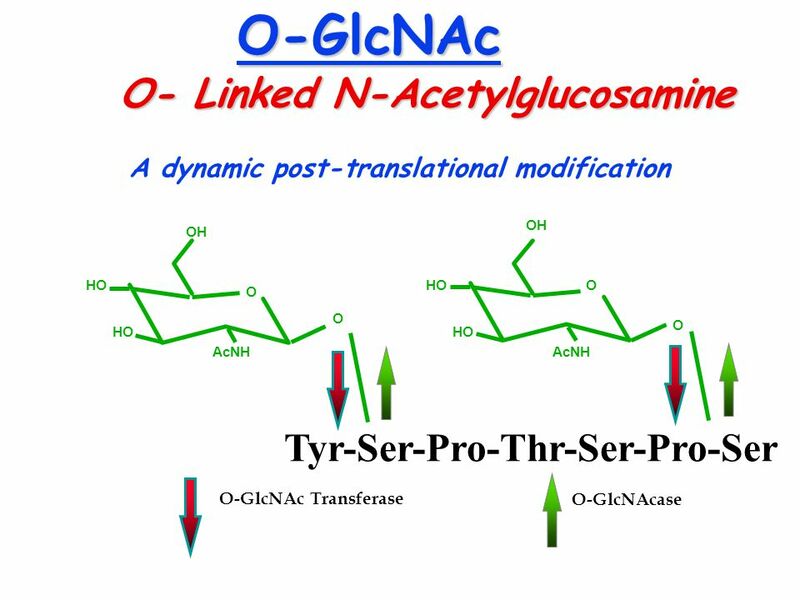  Same Approach work for ‘classical’ O-glycans. 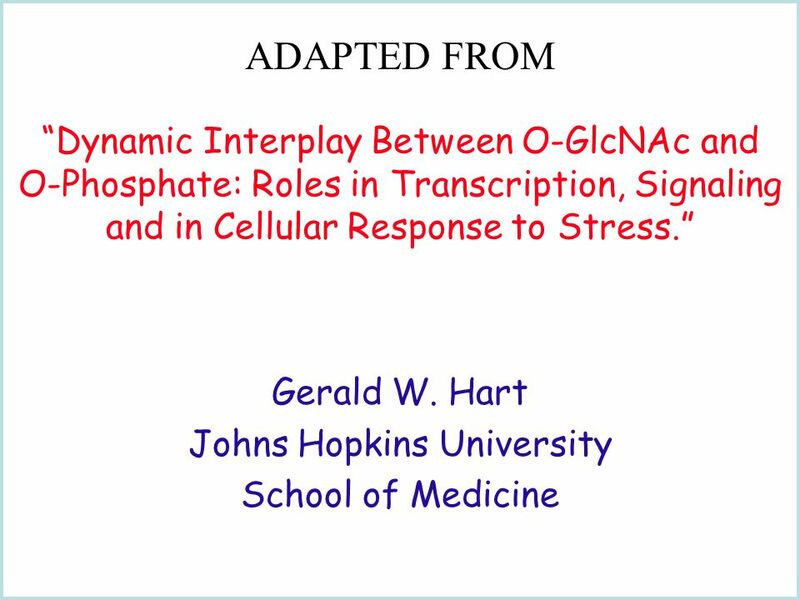  Phosphorylation Mapping studies Must Account for Abundance of O-GlcNAc. 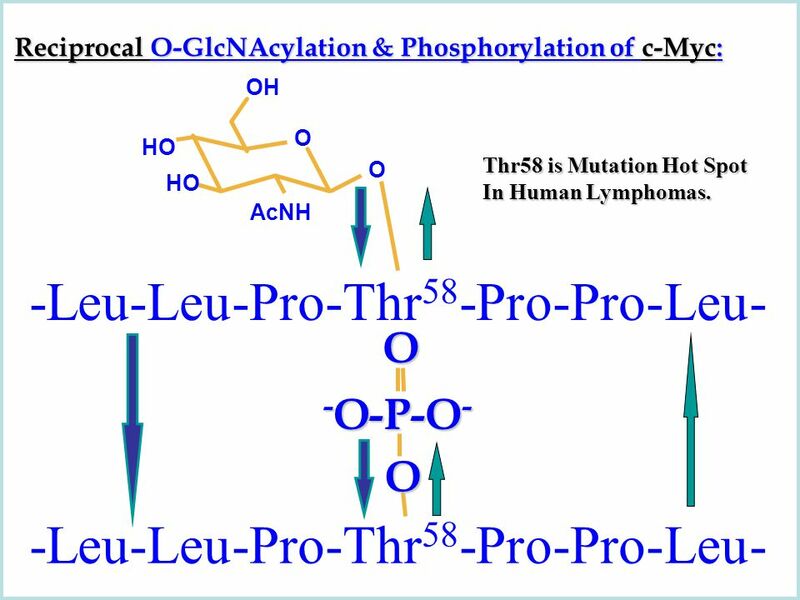 24 OH O AcNH HO O -Leu-Leu-Pro-Thr 58 -Pro-Pro-Leu- O O Reciprocal O-GlcNAcylation & Phosphorylation of c-Myc: -P-O - -O-O-O-O Thr58 is Mutation Hot Spot In Human Lymphomas. 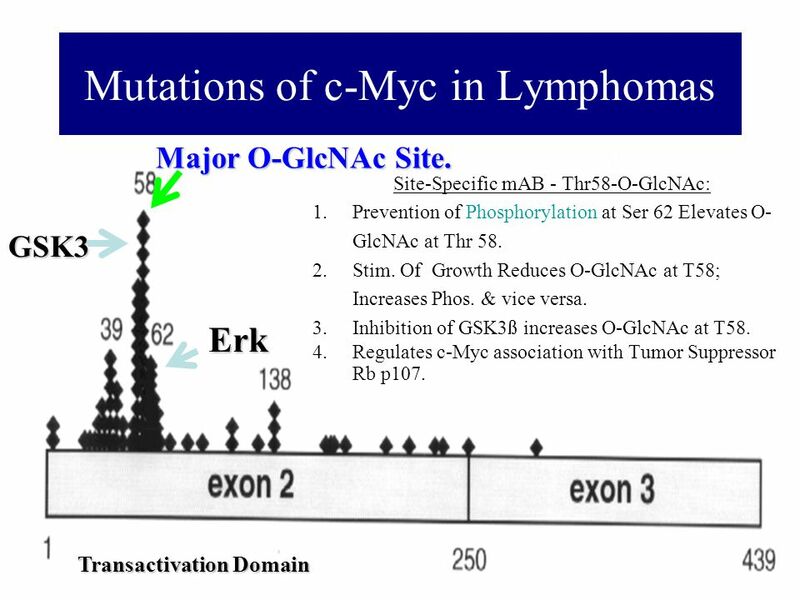 25 Mutations of c-Myc in Lymphomas Major O-GlcNAc Site. Transactivation Domain GSK3 Erk Site-Specific mAB - Thr58-O-GlcNAc: 1.Prevention of Phosphorylation at Ser 62 Elevates O- GlcNAc at Thr 58. 2.Stim. 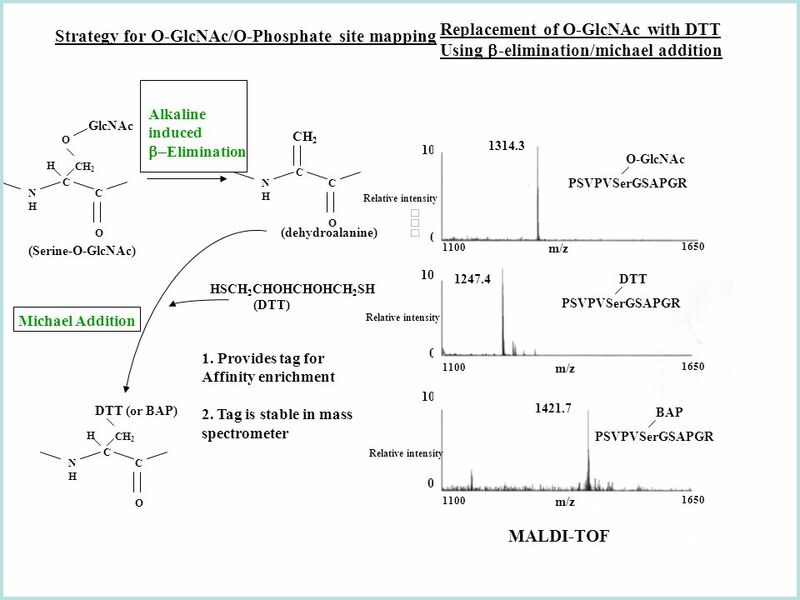 Of Growth Reduces O-GlcNAc at T58; Increases Phos. & vice versa. 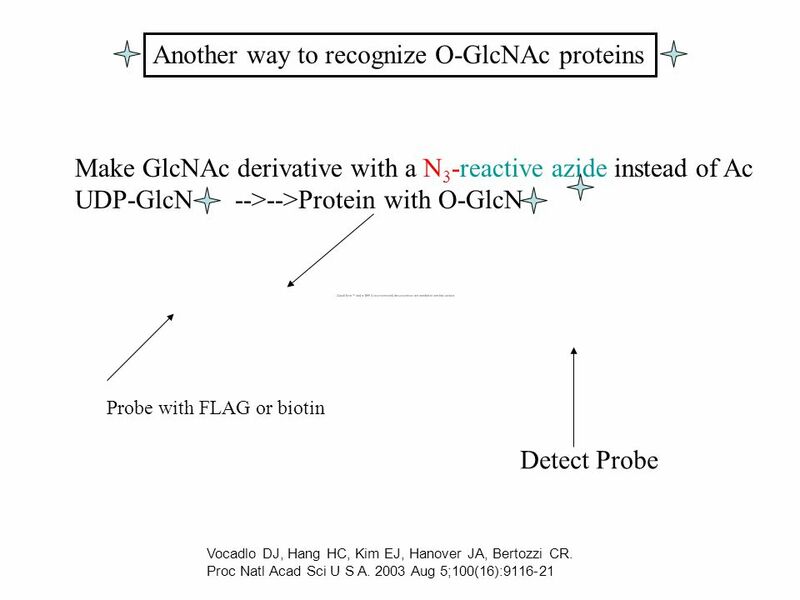 3.Inhibition of GSK3ß increases O-GlcNAc at T58. 4.Regulates c-Myc association with Tumor Suppressor Rb p107. 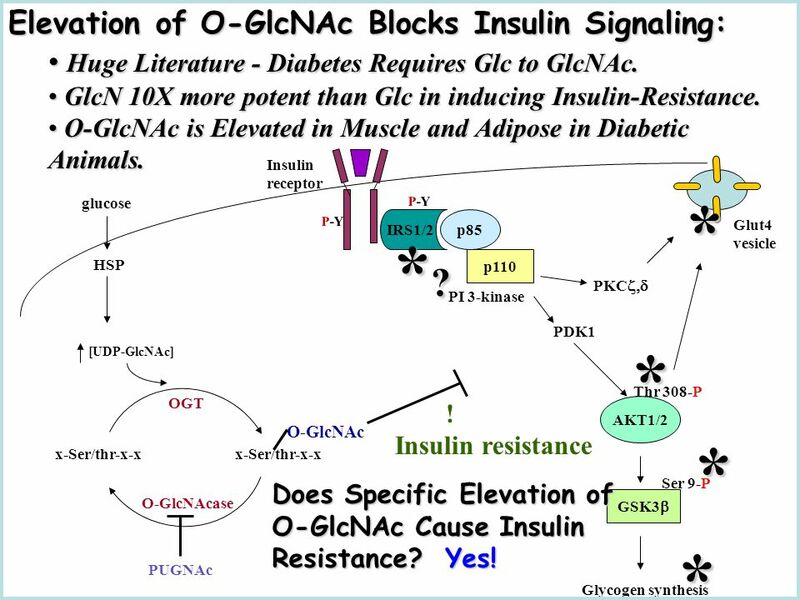 31 Elevation of O-GlcNAc Blocks Insulin Signaling: Huge Literature - Diabetes Requires Glc to GlcNAc. 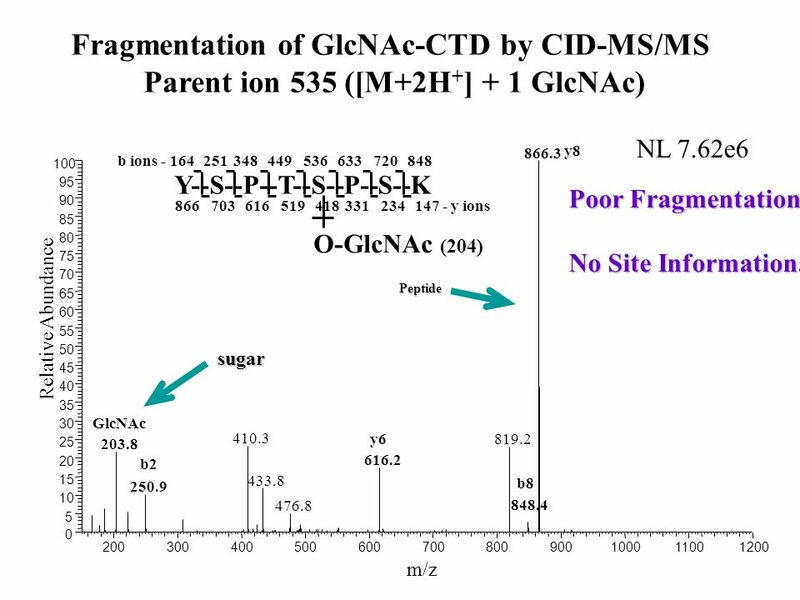 Huge Literature - Diabetes Requires Glc to GlcNAc. GlcN 10X more potent than Glc in inducing Insulin-Resistance. GlcN 10X more potent than Glc in inducing Insulin-Resistance. 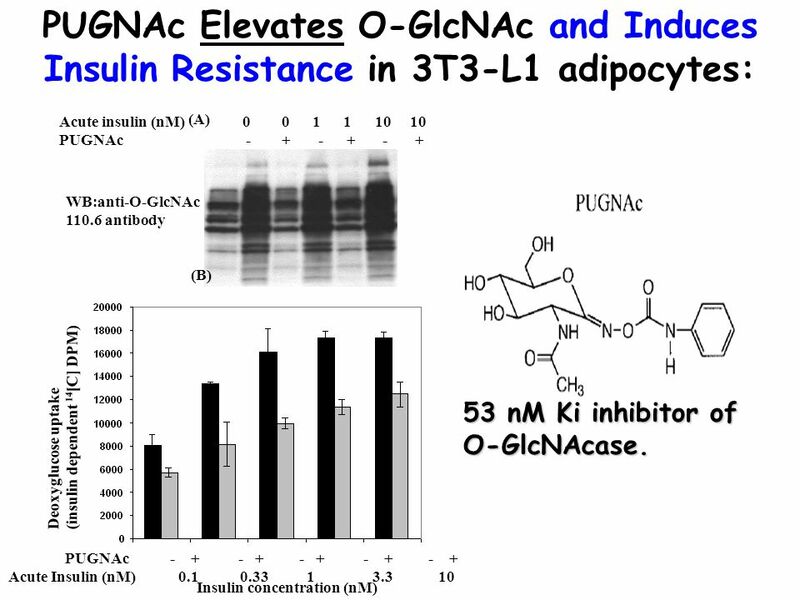 O-GlcNAc is Elevated in Muscle and Adipose in Diabetic Animals. 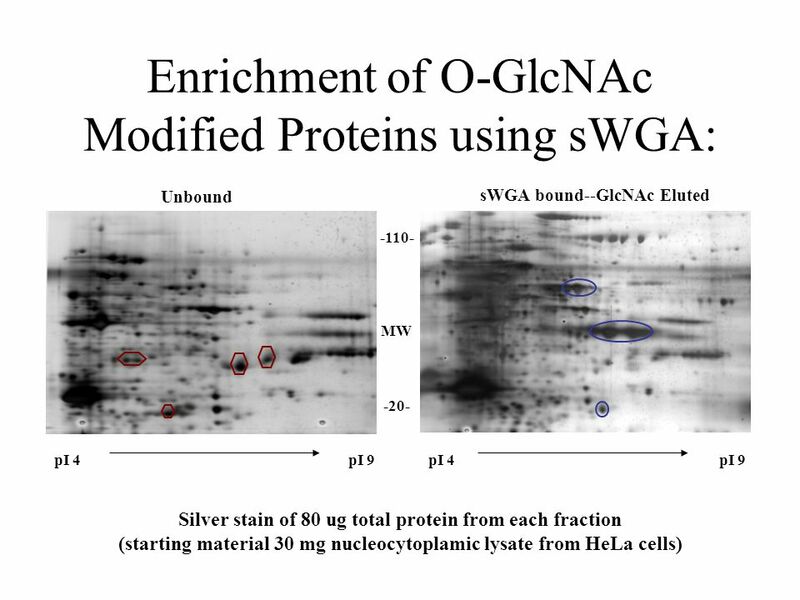 O-GlcNAc is Elevated in Muscle and Adipose in Diabetic Animals. 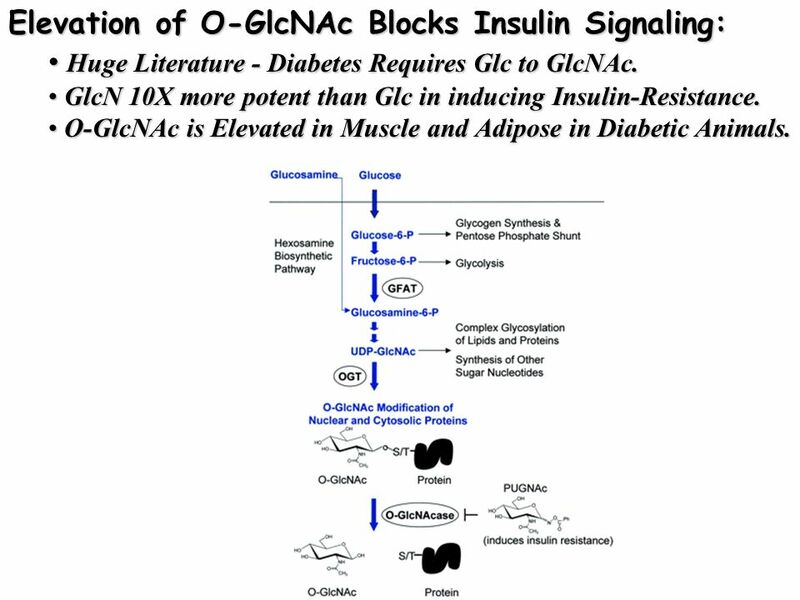 33 Glucosamine (mM) 0 0 5 5 chronic insulin (nM) 0 1 1 0 Deoxyglucose uptake (insulin dependent 14 [C] DPM) 20000 10000 0 51% WB: anti-O-GlcNAc Insulin Resistance induced through the HBP correlates with increased O-GlcNAc in 3T3-L1 Adipocytes Requires Both GlcN & Insulin for Insulin-Resistance & for Elevated O-GlcNAc. 34 (A) Insulin concentration (nM) 23% 39% Acute insulin (nM) 0 0 1 1 10 10 PUGNAc - + - + - + WB:anti-O-GlcNAc 110.6 antibody PUGNAc - + - + - + - + - + Acute Insulin (nM) 0.1 0.33 1 3.3 10 Deoxyglucose uptake (insulin dependent 14 [C] DPM) (B) PUGNAc Elevates O-GlcNAc and Induces Insulin Resistance in 3T3-L1 adipocytes: 53 nM Ki inhibitor of O-GlcNAcase. 36 PUGNAc does not effect the protein levels or insulin stimulated tyrosine phosphorylation of the insulin receptor or IRS-2. 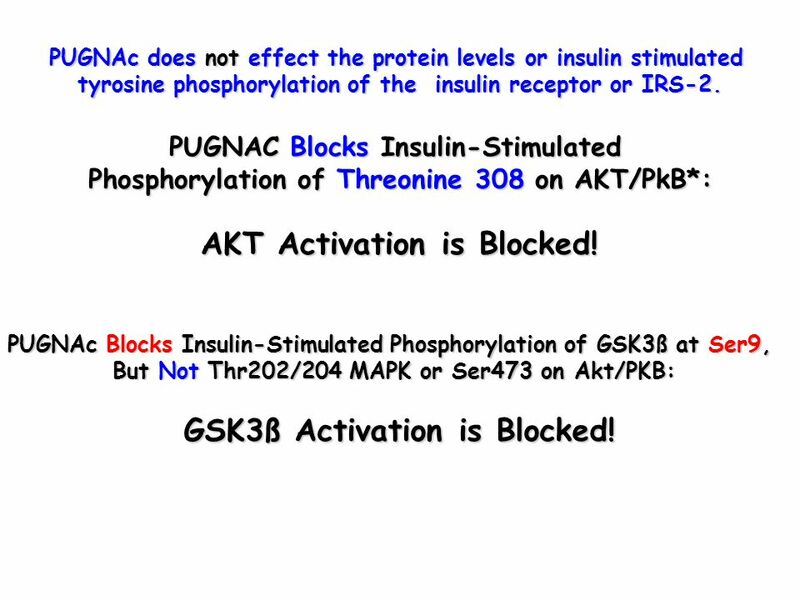 PUGNAC Blocks Insulin-Stimulated Phosphorylation of Threonine 308 on AKT/PkB*: AKT Activation is Blocked! 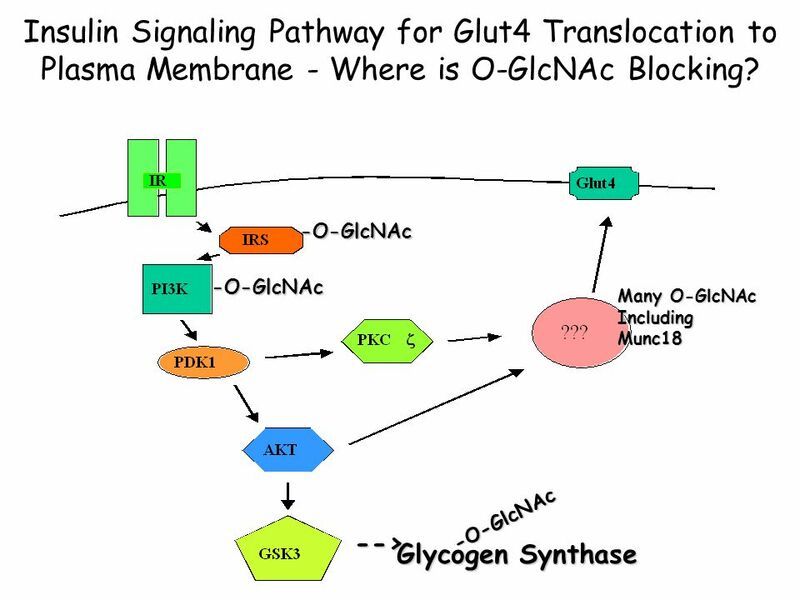 PUGNAc Blocks Insulin-Stimulated Phosphorylation of GSK3ß at Ser9, But Not Thr202/204 MAPK or Ser473 on Akt/PKB: GSK3ß Activation is Blocked! 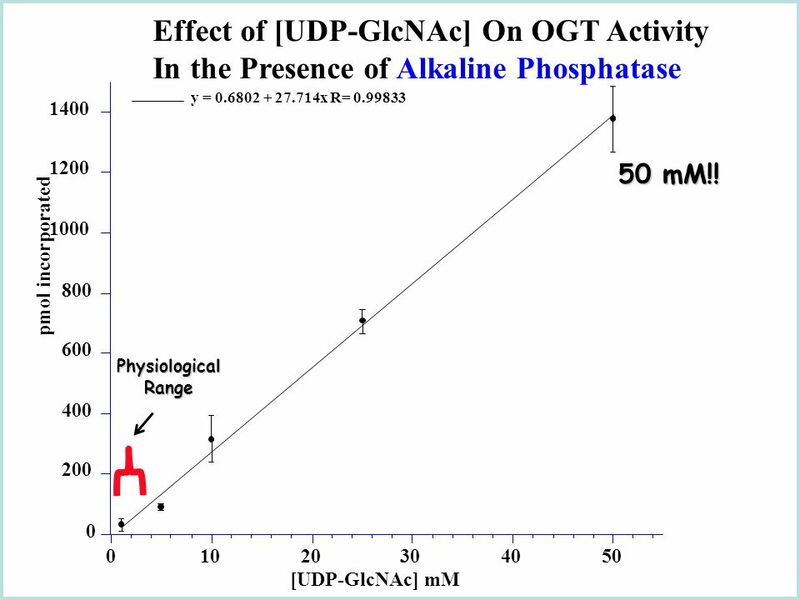 37 [UDP-GlcNAc] HSP OGT x-Ser/thr-x-x O-GlcNAc O-GlcNAcase glucose Glut4 vesicle PDK1 AKT1/2 Thr 308-P PKC  GSK3  P-Y IRS1/2 Insulin receptor P-Y p85 p110 PI 3-kinase Glycogen synthesis Ser 9-P PUGNAc ! 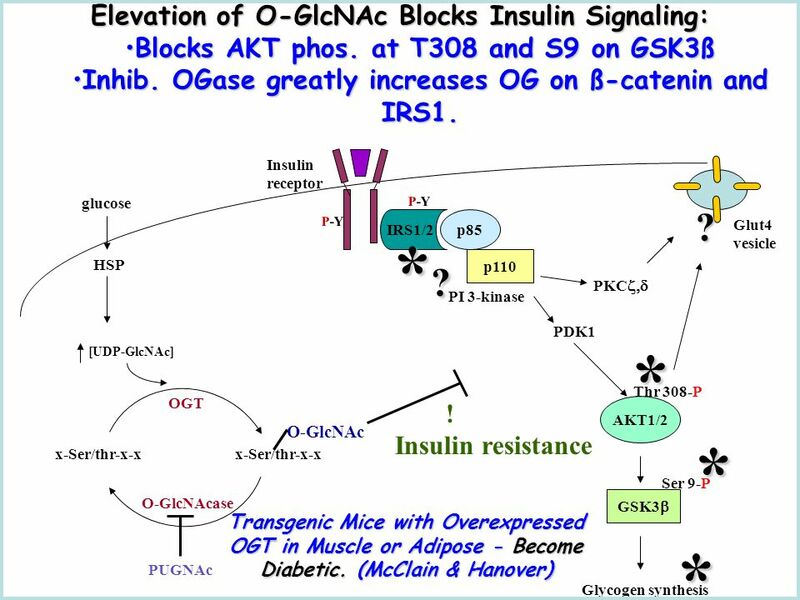 Insulin resistance Elevation of O-GlcNAc Blocks Insulin Signaling: Blocks AKT phos. at T308 and S9 on GSK3ßBlocks AKT phos. at T308 and S9 on GSK3ß Inhib. OGase greatly increases OG on ß-catenin and IRS1.Inhib. OGase greatly increases OG on ß-catenin and IRS1. 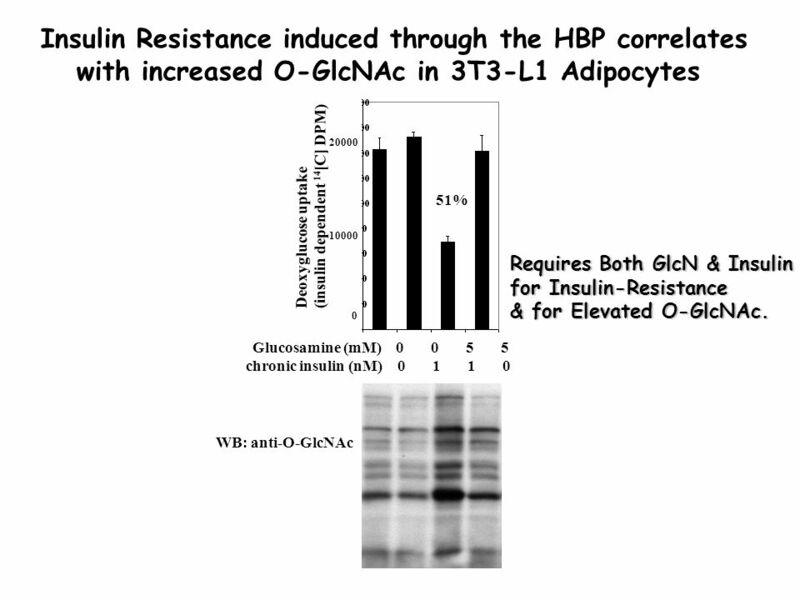 Transgenic Mice with Overexpressed OGT in Muscle or Adipose - Become Diabetic. (McClain & Hanover) * * *?*?*?*? * ? 38 Insulin (nM) 0 1 100 IP: OGT WB: OGT IP: OGT WB:PY OGT Fig. 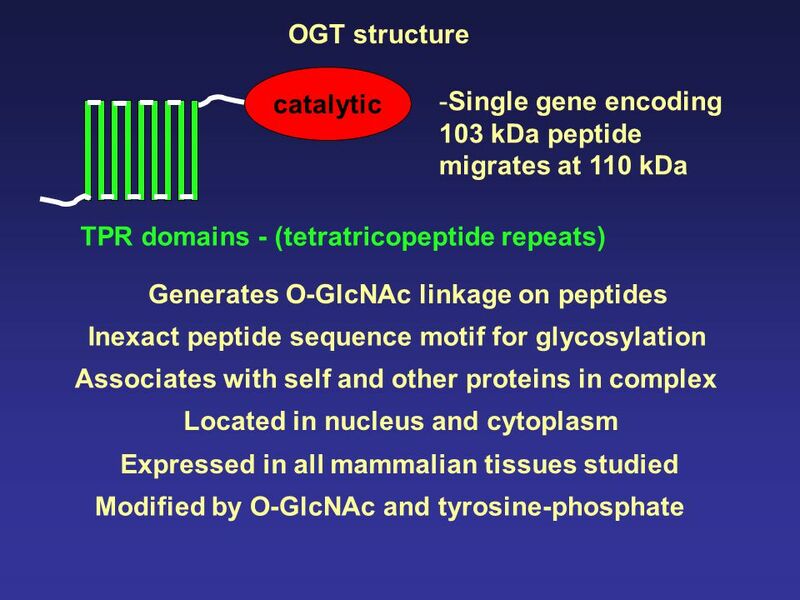 Insulin stimulated tyrosine phosphorylation of O-GlcNAc transferase (OGT). 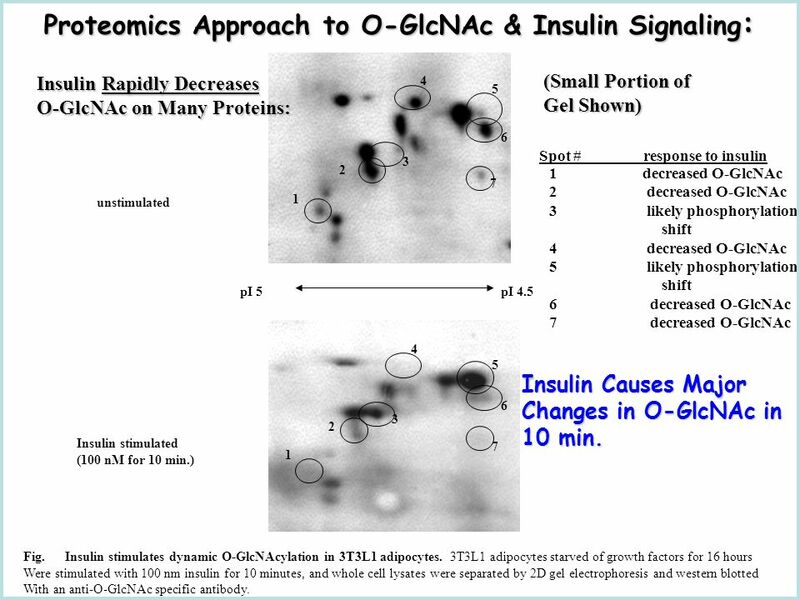 3T3L1 adipocytes starved of growth factors For 16 hours were stimulated 10 minutes with insulin at suboptimal (1 nM) or optimal (100 nM) concentrations, and OGT Immunoprecipitates were western blotted for either OGT levels or phosphotyrosine. Note: activity of these immunoprecip Was tested with no differences against CKII peptide. Post-translational modification may effect localization, substrate specificity, binding Partners, ect. (SH2 domain containing protein ?) 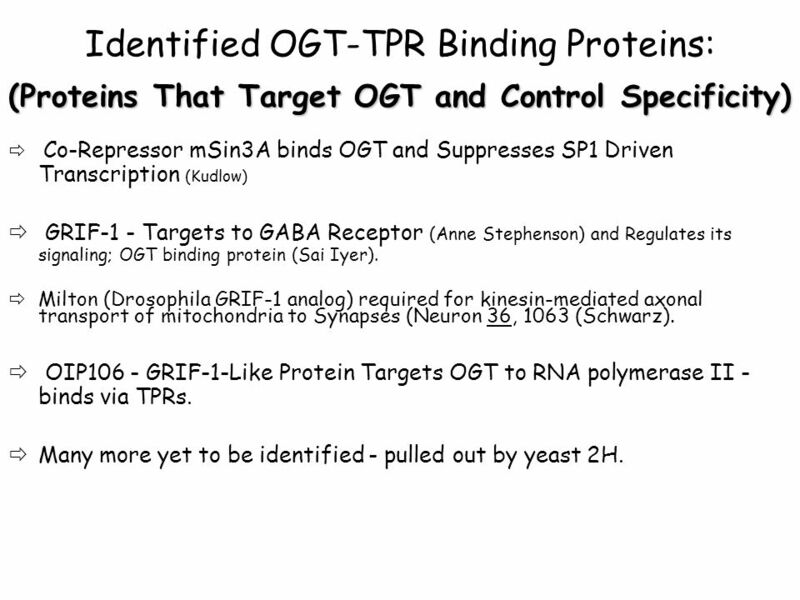 Phospho-tyrosine response would place OGT in Signaling pathway downstream of insulin Receptor. time point coincides with start of glucose Uptake assay. 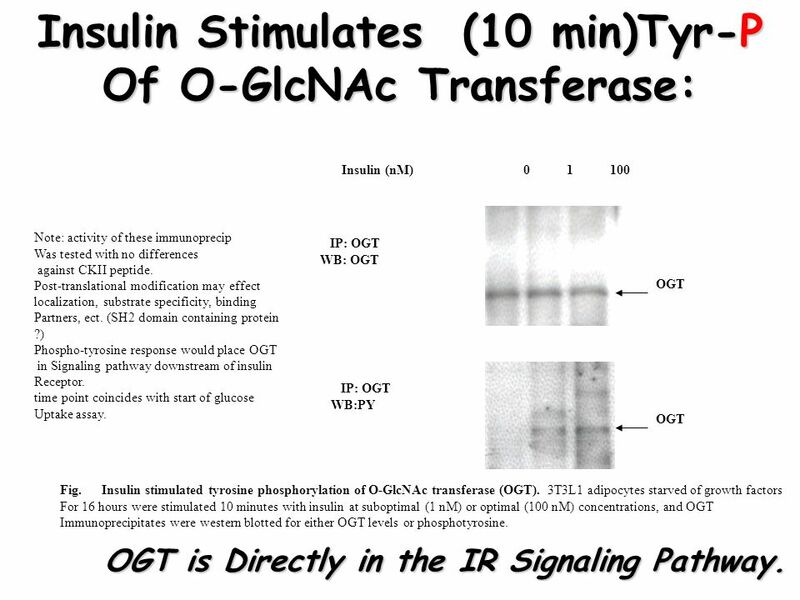 Insulin Stimulates (10 min)Tyr-P Of O-GlcNAc Transferase: OGT is Directly in the IR Signaling Pathway. 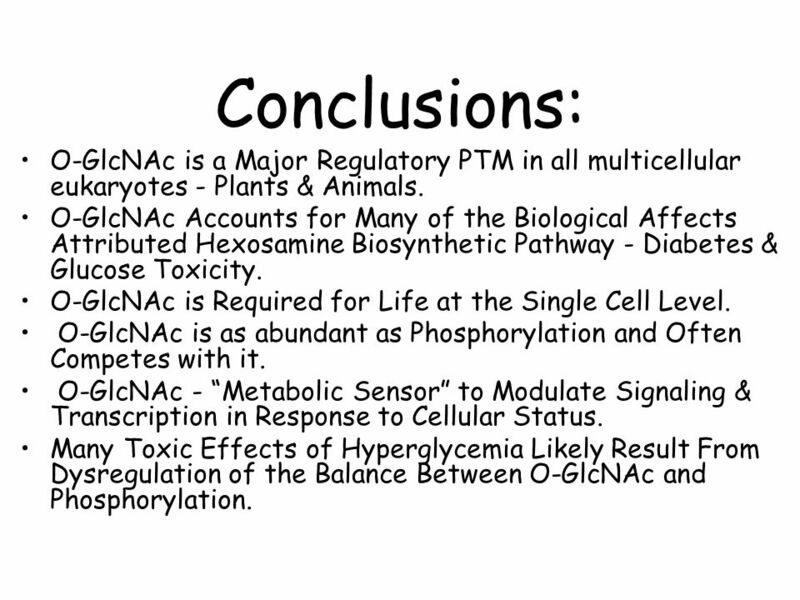 40 Conclusions: O-GlcNAc is a Major Regulatory PTM in all multicellular eukaryotes - Plants & Animals. 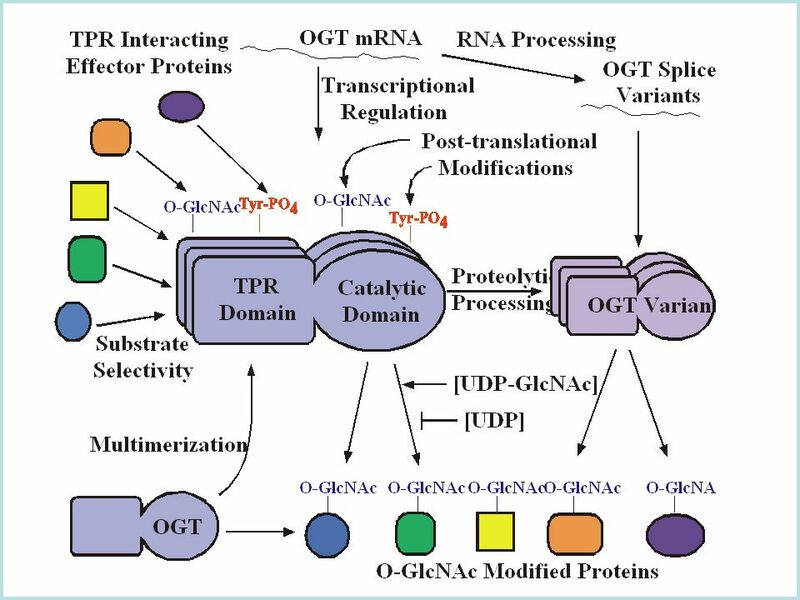 O-GlcNAc Accounts for Many of the Biological Affects Attributed Hexosamine Biosynthetic Pathway - Diabetes & Glucose Toxicity. 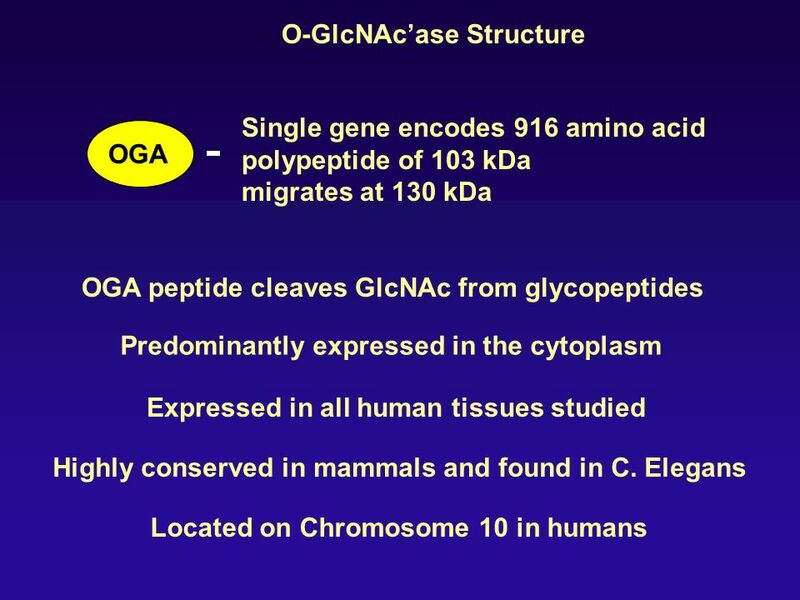 O-GlcNAc is Required for Life at the Single Cell Level. 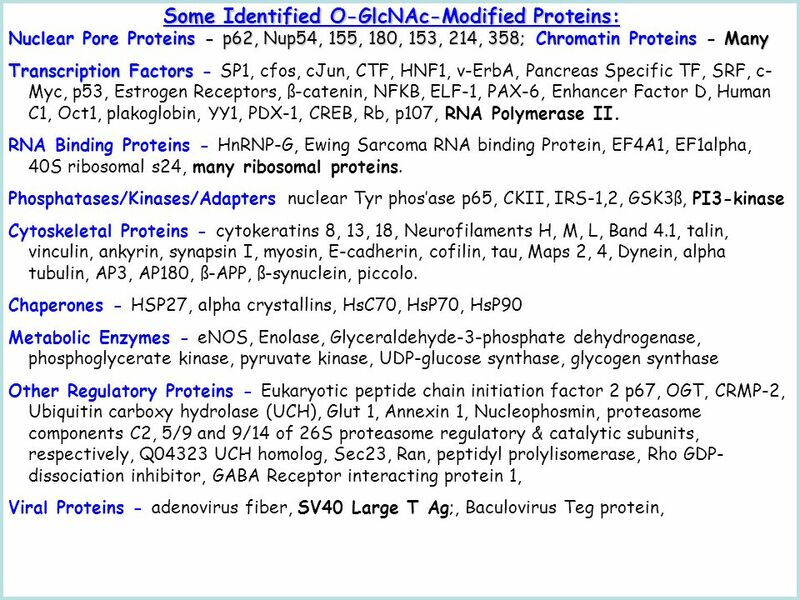 O-GlcNAc is as abundant as Phosphorylation and Often Competes with it. 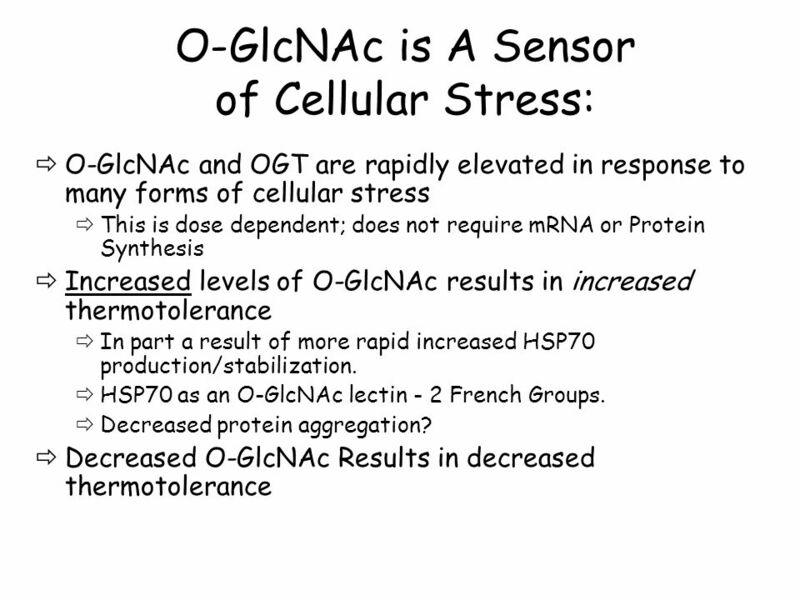 O-GlcNAc - “Metabolic Sensor” to Modulate Signaling & Transcription in Response to Cellular Status. 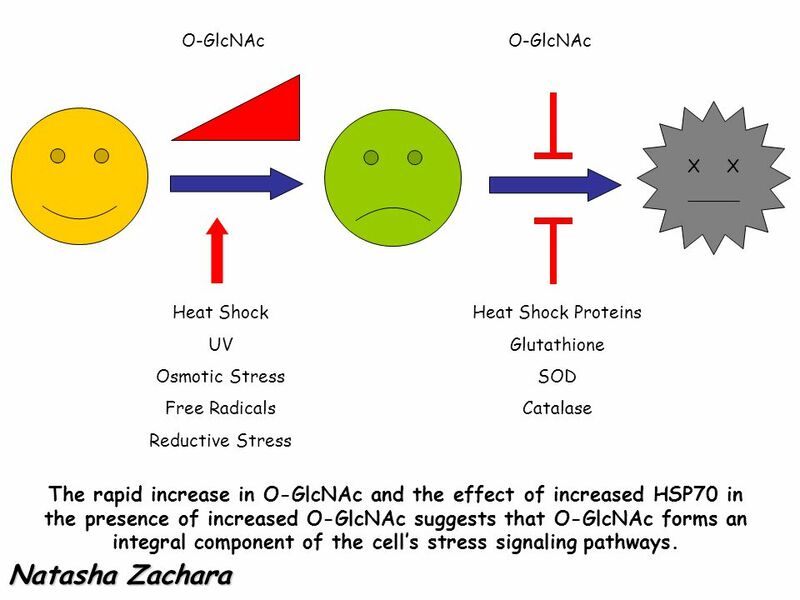 Many Toxic Effects of Hyperglycemia Likely Result From Dysregulation of the Balance Between O-GlcNAc and Phosphorylation. 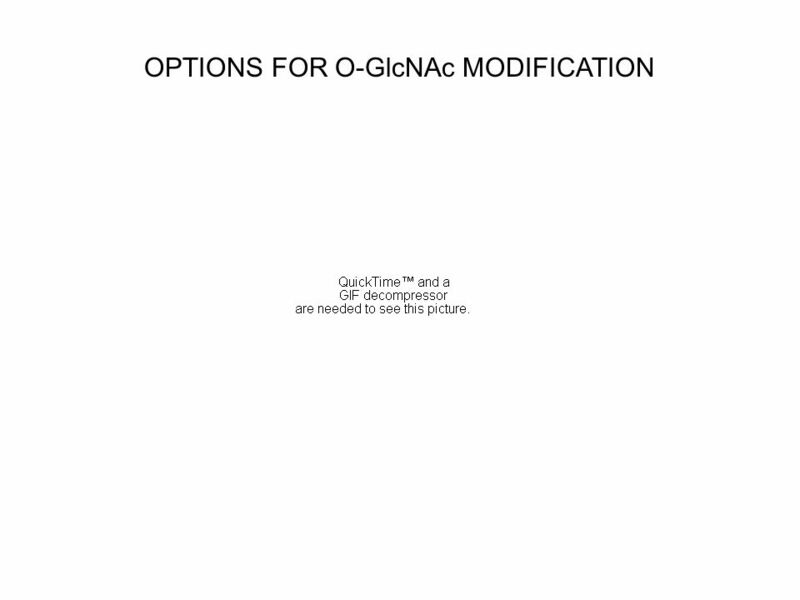 Download ppt "ESSENTIALS OF GLYCOBIOLOGY LECTURE 15 The O-GlcNAc Modification Hud Freeze." 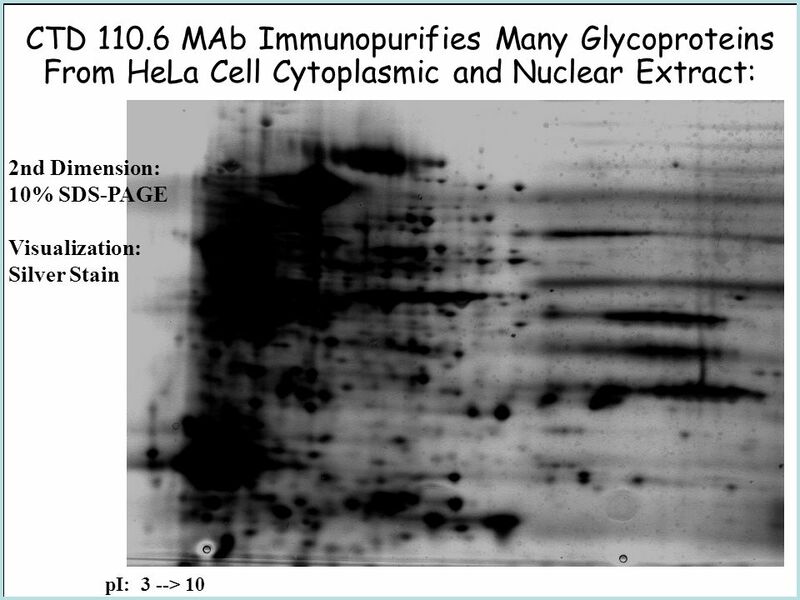 ESSENTIALS OF GLYCOBIOLOGY LECTURE 16 NUCLEAR, CYTOPLASMIC, AND MITOCHONDRIAL GLYCOSYLATION Hud Freeze. Post-Translational Modifications: CrossTalk Robert Chalkley Chem 204. 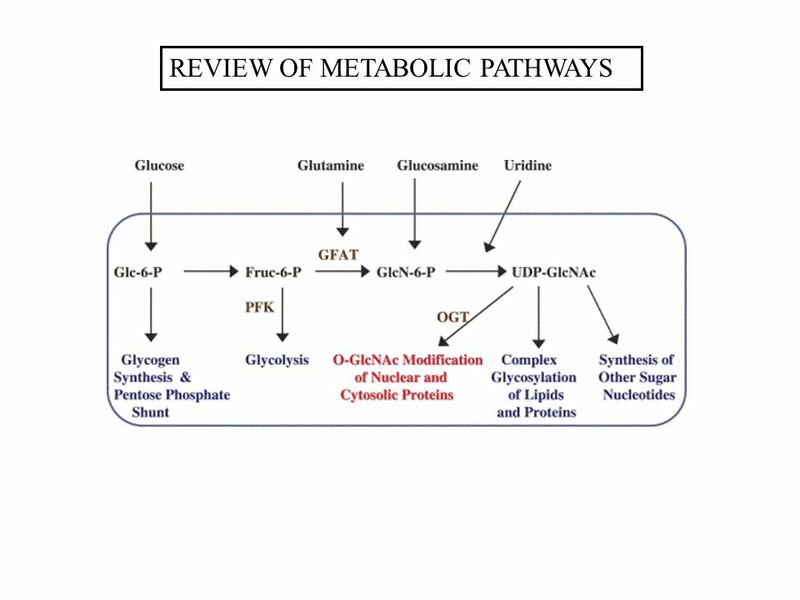 Glycogen Metabolism Copyright © by Joyce J. Diwan. All rights reserved. Molecular Biochemistry I.
ESSENTIALS OF GLYCOBIOLOGY LECTURE 13 OTHER TYPES OF GOLGI GLYCOSYLATION Hud Freeze. AGEING CAN BE DEFINED AS THE PROGRESSIVE LOSS OF FUNCTION ACCOMPANIED BY DECREASING FERTILITY AND INCREASING MORTALITY. Medical Biochemistry Membranes: Membrane receptors; G-proteins Lecture 73 Membranes: Membrane receptors; G-proteins Lecture 73. Molecular Basis for Relationship between Genotype and Phenotype DNA RNA protein genotype function organism phenotype DNA sequence amino acid sequence transcription. Cell signalling 26 March 2007. Cell communication Chapter 9 Genes and Development. Endo. 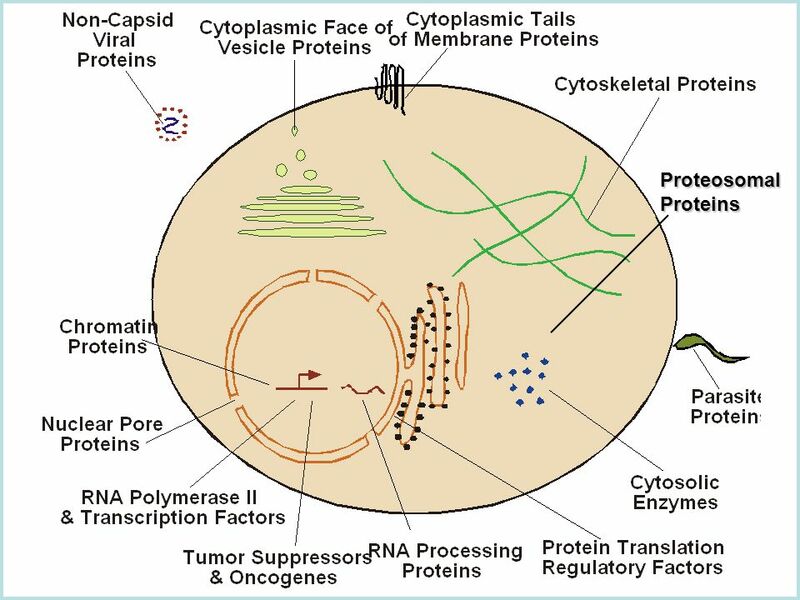 4 Detecting and signalling Cell surface receptors: G protein linked and tyrosine kinase receptors: second messengers, phosphorylating kinases, activation. Chap. 7 Transcriptional Control of Gene Expression (Part A) Topics Control of Gene Expression in Bacteria Overview of Eukaryotic Gene Control and RNA Polymerases. AP Biology Control of Eukaryotic Genes Chapter 20. CHAPTER 8 Metabolic Respiration Overview of Regulation Most genes encode proteins, and most proteins are enzymes. The expression of such a gene can be. Lecture #8Date _________ n Chapter 19~ The Organization and Control of Eukaryotic Genomes.